﻿ This week, I’ll be meeting with some of the best Human Resource and Recruiting professionals in the industry that spans over Retail, Finance & Accounting, and Consumer Packaged Goods to discuss challenges we’re facing with recruitment and retention. As Director of Career Connections for SIFE USA (I write for my blog on the weekends), I have the pleasure of working with these individuals on a daily basis through the Career Connections Network, or CCN. It’s good to come together a few times a year in an environment that allows us to network, share best practices and benchmark with others. As I have developed as a professional over the years, I’ve learned quickly (from the mistakes of my own and others’) what makes meetings most effective for all parties involved. Since we’re gearing up for our bi-annual CCN meeting this week at JC Penney’s headquarters in Plano, TX, I thought that this topic was relevant. As a job seeker, it’s important to make the most out of your meetings. Go with a plan, ask the right questions, and follow up. Sound familiar? When you enter the workforce, you’ll find yourself in a plethora of meetings every week. Wouldn’t it be great to know how to maximize your time and team’s resources in those meetings? Below are a few tips that I’ve picked up over the past several years – feel free to add your tips for effective meetings in the comments section. I know I didn’t cover them all, so please chime in! Start on time. Respect others’ time. Communicate the meeting location and start time with all appropriate team members. Then, start on time. There are exceptions (if the team leader is delayed, etc. ), but it’s a good rule to start your meetings on time as scheduled. It’s just good manners. We’re all busy. We’re working with a small amount of resources and are expected to deliver more results than ever before. Respect those that are in attendance on time by starting on time. 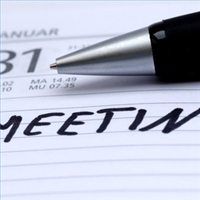 If you can’t officially start your meeting because the leader isn’t available, reschedule. Don’t waste time. What’s worse than not starting on time? Ever had someone show up late for a meeting, only to start a random conversation (talk about weekend activities, last night’s date, or something similar), derailing the entire meeting for 10-15 minutes or longer? That’s no fun – and it’s disrespectful. If you’re leading the meeting, get to the point. It’s ok to be nice, but you called the meeting – let everyone know why and start working. Know the agenda and stay on point. Meetings are most effective when there is an agenda. Think of it as your game plan. Keep it simple and succinct. Don’t let others get off topic with randomness. Bench unrelated items for offline follow up afterwards. You may be able to accomplish this through a conversation offline, or may have to call a separate meeting to discuss the additional items. Know your plan of action. There’s a reason you’re meeting, right? Know the next steps. Communicate the next steps, action items and deliverables effectively to your team. Sometimes, it’s good to meet for a status update, but ask yourself this: Is it the most effective use of your time together as a team? Could you do this via conference call or email? Instead of a status update meeting, design your meetings with a clear plan of action and hold yourself and your team accountable for the outcomes of that plan. Think you’ll look at the next meeting a little differently? I know I will. If you’re interested in learning more about the SIFE CCN meeting, follow the Twitter hashtag #sifeccn this week. We’ll be updating throughout the meeting, sharing some of the good nuggets of information and best practices. If you’re interested in learning more about SIFE, please connect with me on LinkedIn. I’d love to speak with you about partnership opportunities! As always, thanks for reading! About SIFE: SIFE is an international non-profit organization that brings together the leaders of today and tomorrow to create a better, more sustainable world through the positive power of business. Founded in 1975, SIFE has active programs on more than 1,500 college and university campuses in 39 countries. Through projects that improve the lives of people worldwide, the university students, academic professionals and industry leaders who participate in SIFE are demonstrating that individuals with a knowledge and passion for business can be a powerful force for change. For more information, contact SIFE World Headquarters at +1 417 831 9505 or visit www.sife.org.